There are only two guest rooms - or two villas - which is the greatest feature of this hotel. 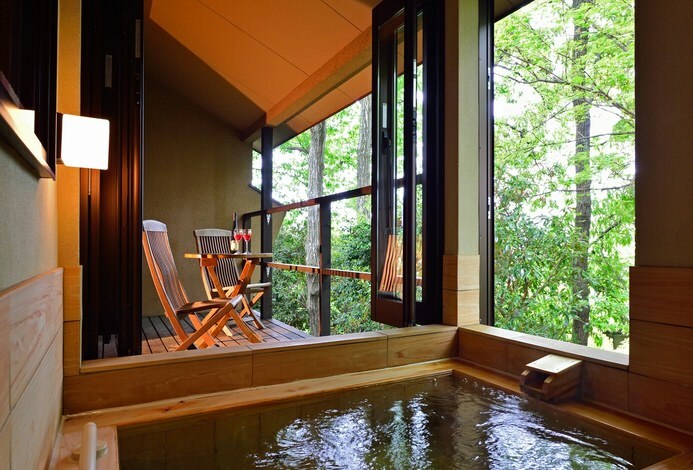 The villas are located in the midst of the 10,000-square-meter forest in the skirt of Izu-Kōgen. 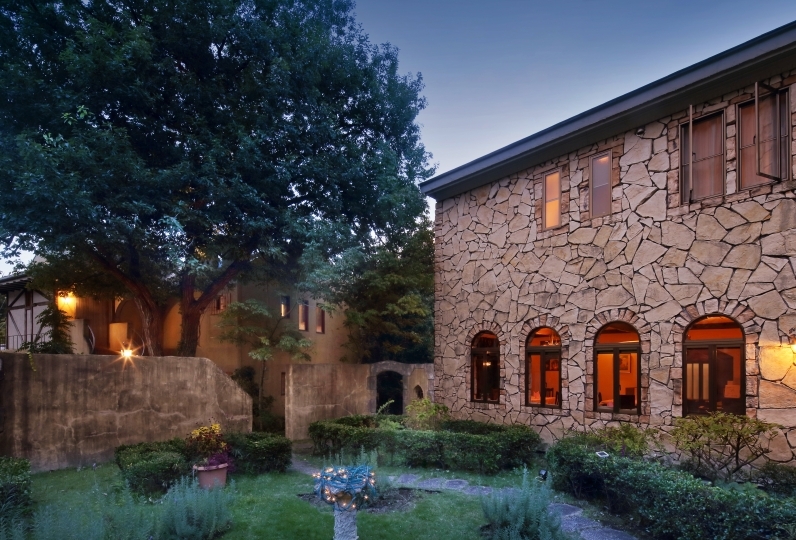 You would feel as if you were visiting your own private villa. 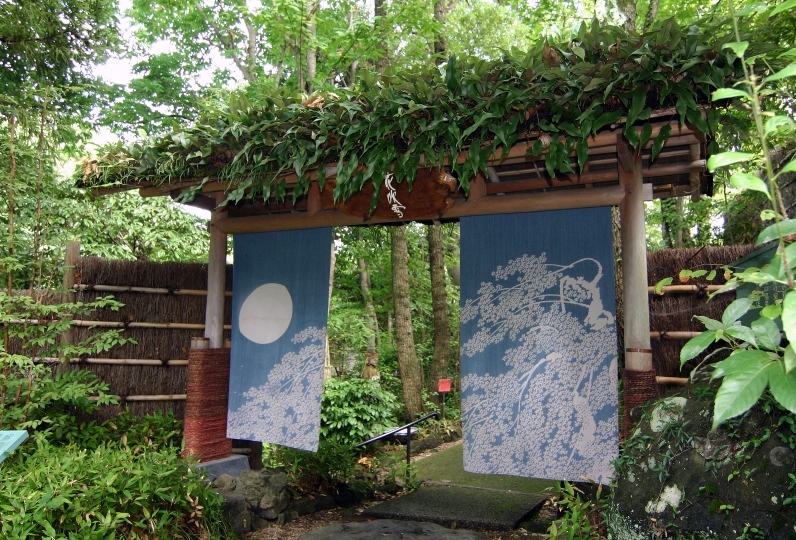 The location at the top of Shirogasaki is distinguished. 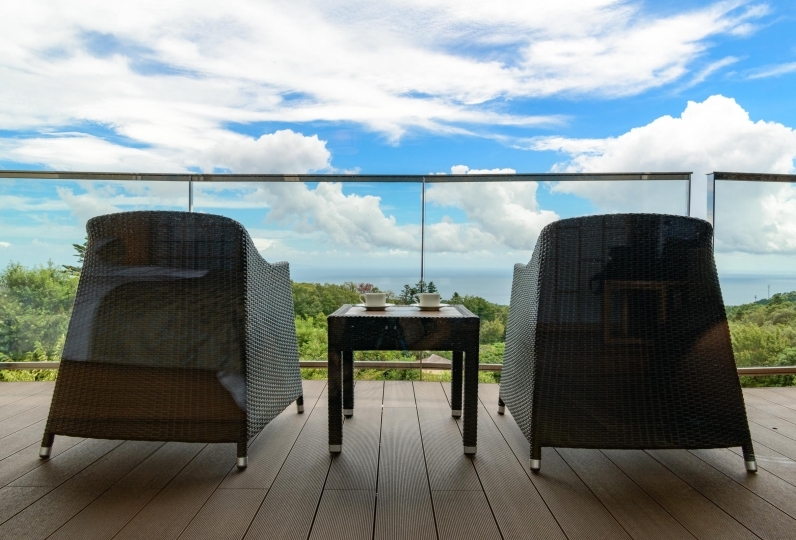 You can enjoy the magnificent view of Izu Peninsula from your room. 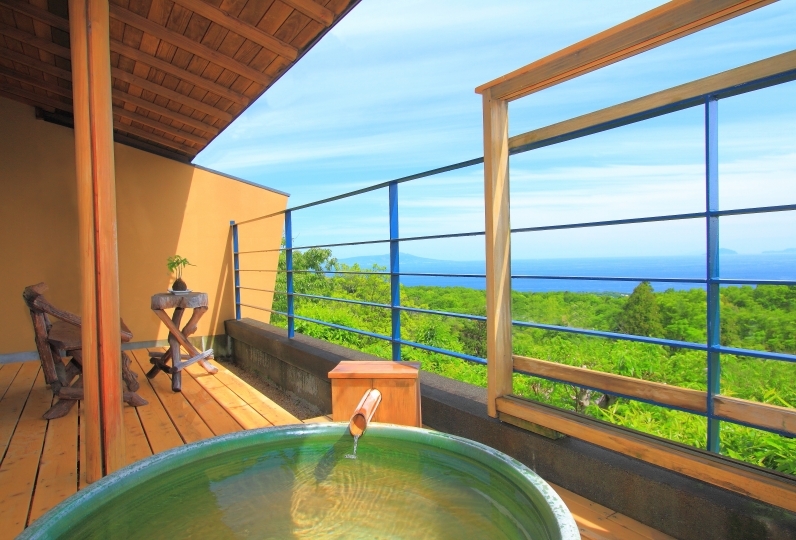 Furthermore, two villas have both an open-air bath and a bath with spectacular view. Since old folk houses in Nagano and Gunma were relocated to build these villas, they have their own characters and histories. 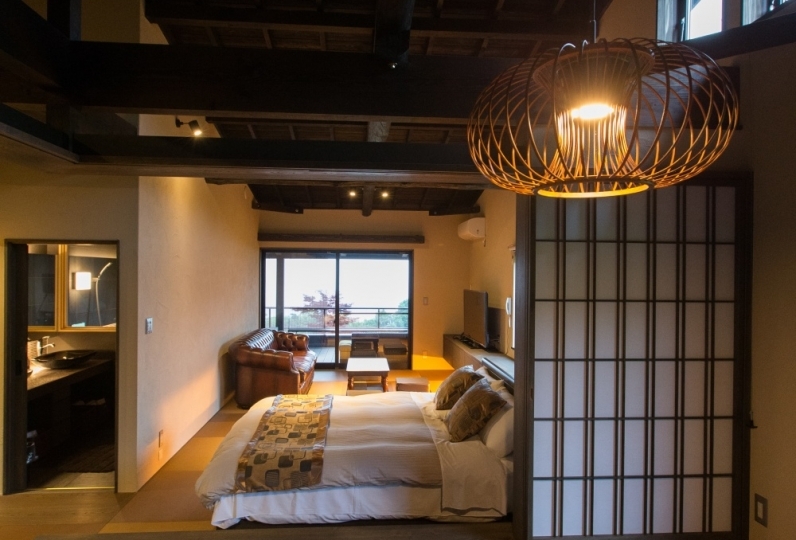 The earthen wall and the bare beams give a warmth to the room which helps to create a unique atmosphere. The room is furnished with the items of value. People with keen eyes will identify with how invaluable they are, such as the original piece of furniture made in Denmark. As you can see from the names of the villas - Kan (Serenity) and Yu (Eternity) - the greatest offer of these villas is its tranquility. Enjoy reading books while taking a bath, listening to music on CD deck, or enjoying your drinks. 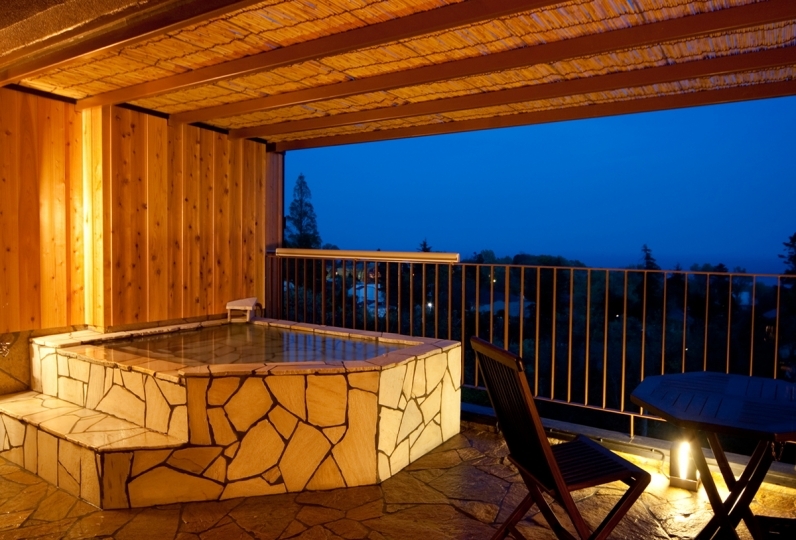 It is the perfect place for you to enjoy a private time with your loved one. I informed in advance that I was pregnant, but I have prepared a knee-rest in the room and the dining room, and I was able to stay in peace, giving me enough consideration for my food and drinks. The The room was an image of a very simple facility, but if you look at the rolling-rolling ceiling with your husband and listen to the sound of the birds and the open-air bath, your mind will be soft and clear I was able to relax. The height of the ceiling and the light coming from the skylights were very comfortable. This was the first time I had a sleepy inn, and I woke up to sleep well and I was impressed by the good quality sleep the next morning. The food was exciting and the amount was moderately full! The bowl is just lovely and the eyes and tongue are very happy. Even for sightseeing places that I wanted to visit, I could go in about 10 minutes by car, so I was able to spend plenty of substantial time. The staff members are also kind, remembering and healing your personality and consideration after returning from your trip. I was told that a squirrel could be seen in the near future, and I was able to see a natural squirrel for the first time! Looking for a squirrel while entering an open-air bath was also considered a way of enjoyment that can only be enjoyed here. It is regrettable that it can not be transmitted if it is a letter. Anyway I was moved by everything. I want to stay again. I'm really thankful to you. thank you for helping me. Since the departure day was work, I apologize for having breakfast time sooner. The meal was very tasty. We said that the wife who is not good at sashimi is delicious. 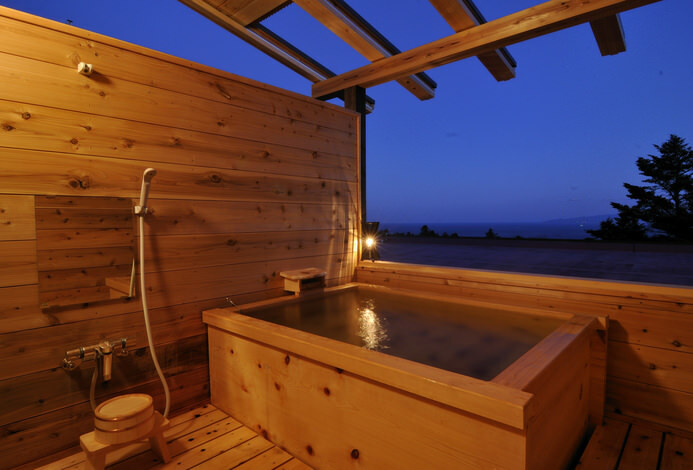 At night, when I woke up I thought if it was raining, it was a sound of a hot spring sink. I have been running hot water for a long time, and the temperature of the hot water was just right and I let you in many times. It was a very good bath. Thank you very much. -All drinks inside the refrigerator are free. -Check in and Checkout is available through the room. ・We regret that we do not accept card payment. Please be aware that the payment needs to be by cash. ・We are sorry to inform that children under the age of 12 will not be able to stay at the rooms in the main building. ※Children's accommodation is possible at Suite Villa.